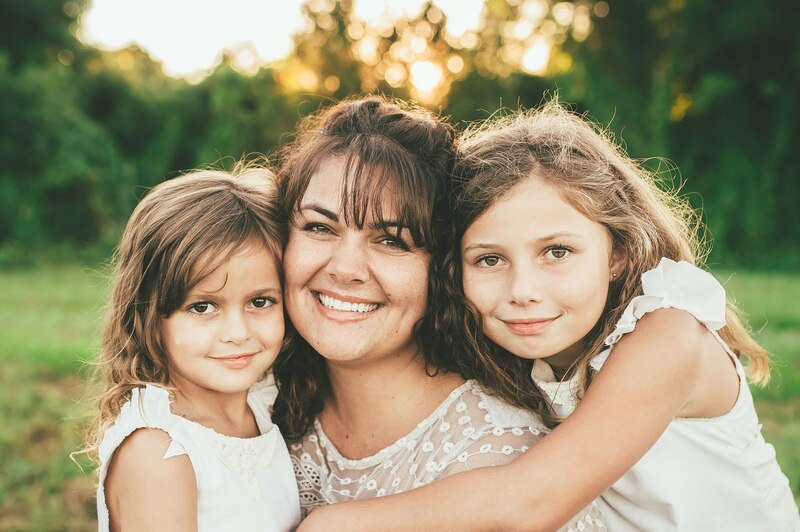 My friend Tricia and my sister Darby and I attended a huge Book Fest at the Jacksonville Public Library about a month back, mostly to meet our favorite author, Maggie Steifvater. While there we shopped the San Marco Bookstore set up inside the library. I purchased two Paddywax travel tins from their Library collection. I chose the authors John Steinbeck and Mark Twain. These are tiny 2.5 ounce candle tins with two wicks that travel well. Great for hotels or quickly, and briefly, scenting smaller areas. I paid $8.00 each for mine, but the Paddywax website sells a pair of them for $18.00. Vanilla bourbon laced amber and smoky birch trees, dulcet and warm, furred with tonka beans and shrouded in warmth from a fireside hearth. It reminds me of a more mature and less candy-like Marshmallow Fireside. It threw medium-light in the living room but nice and strong in my bedroom. It will burn fast though... maybe a 1-2 hour life at most. It did tunnel a little due to the wicks being paced so far apart but nothing to bother me since I just wanted to try the scent. I am going to be repurchasing this but in the larger 6.5 ounce glass jars ($21). This was a nice way to "sample" it though. I have a few John Steinbeck favorites but Winter of Our Discontent was probably the most poignant and bittersweet of them. I enjoyed it but it did break my heart. And one photo of Maggie, just because she is so awesome. <3 I pre-ordered her new book All the Crooked Saints, that is set to release on October 10th. I ordered it from her local book store, Fountain Books, because she doodles on and autographs the books that people purchase through there at no additional cost. Pretty neat. I am a geek like that. My Redolent Mermaid Reading Challenge is chugging along quite well for me too. I am currently reading Hollow City which is book two in the Peculiar Children series. Thanks Deb for loaning it to me! What are you reading? 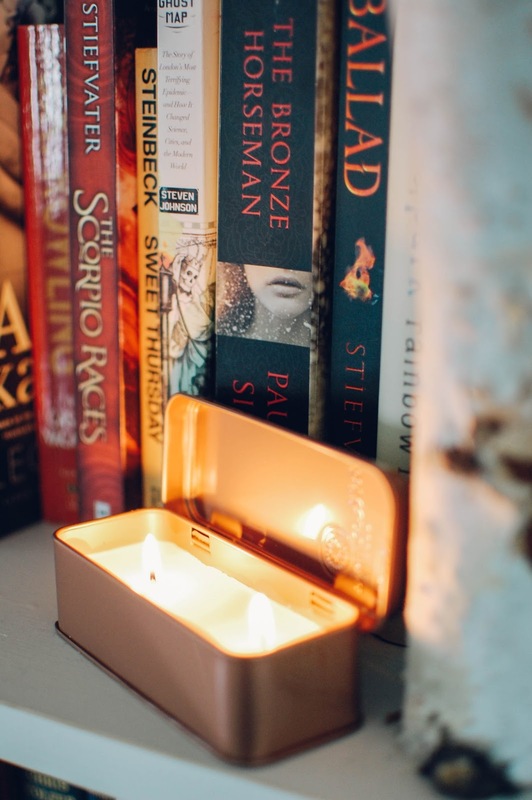 Would you burn bookish candles? Do you enjoy Paddywax Candles? Their Blue Apothecary Vanilla Bean & Myrrh smells amazing and I am dying to try it. Never heard of Paddywax, but the name and packaging is very sweet. I love interpretations of books and authors through scent, they seem to go so well. It is pretty cool packaging. And nice and sturdy too. I do love some great YA reads. Maggie does it very well without being simpering or too fluffy. BookCon in NYC sounds like a dream come true. I hope you take lots of photos and come back with lots of bookish stories and encounters. Any authors you are excited to meet and greet?? 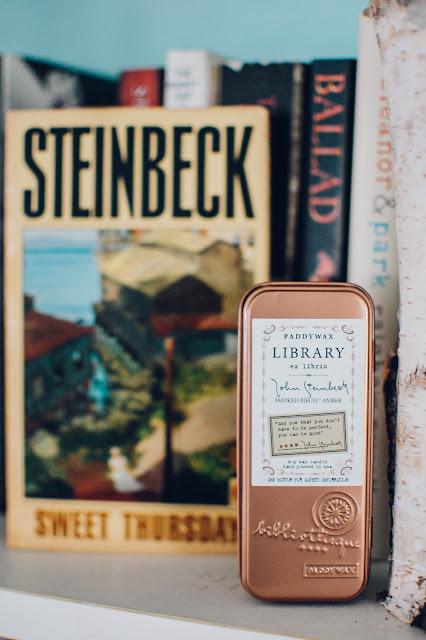 I love anything combining scent and books (my two favorite passtimes!) so I absolutely would burn a book themed candle. I just finished reading A Discovery of Witches by Deborah Harkness, and it was quite good. A very literate, highbrow take on the supernatural romance/thriller genre. Yes!!! What better combo is there?? I keep hearing about that series! Kyme at Alamo Candelaria does a bunch of All Souls Trilogy inspired scents. And I think Book Scents might too. I will have to cave and find that series somewhere. Is it like Anne Rice literary? Just curious. I'm not sure where to put it on the Anne Rice scale, maybe close? The author is actually a professor of history and the history of science, so I was really pleasantly surprised by how well-researched and defined the magical/occult stuff is in the book! It's also very readable and addictive, I already ordered in the rest of the trilogy. I will definitely have to check out the All Souls products from Alamo Candelaria and Book Scents! Thanks for the tip! 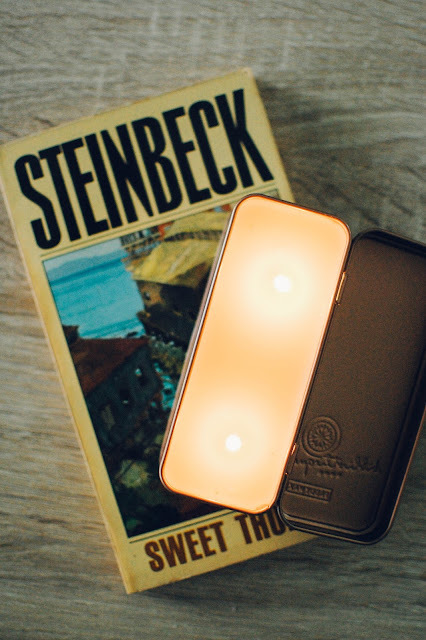 Oh my, my two favorites: books and candles! As I mentioned Steinbeck is one of my favorite authors and East of Eden one of my favorite books! This brand is definitely going on my "to try" list. Those sound like perfect scent notes for JS. I like Mark Twain also; what were the notes on that one? YES!!! Ditto!!! East of Eden! That is one I need to read. I liked Tortilla Flats too. I was considering reviewing the Mark Twain one, once I burn it. It is a tobacco and vanilla scent. Really smooth and sweet. I may have to burn it sooner than later.